Are you looking for sustainable haircare which is healthy and styling efficient at the same time? Then Rahua is the answer. Husband and wife duo Fabian Lliguin and Anna Ayers created Rahua after discovering that women from the Quechua-Shuar tribe use Rahua oil to keep a healthy head of hair. Harvested from deep in the Amazon rainforest, Rahua oil comes from the Ungurahua nut and has been utilized for centuries due to its revitalizing properties. The reason Rahua oil is ideal for shine, though, is because of its molecular structure. The molecule is extremely small which enables it to deeply penetrate strands of hair by bonding to the cortex. As we all know, damaged hair is prone to breakage. Filling these weak places in strands strengthens and restores hair to a hydrated state. Rahua oil also seals the strand’s cuticle which creates a smooth texture. Ultimately, the molecule repairs the composition of the hair, leaving silky, lustrous locks. All of Rahua’s products are nontoxic, sulfate-free, paraben-free, vegan, and cruelty-free. Many of the ingredients are USDA certified organic. Additionally, Rahua products are pH balanced for healthy hair by staying in the range of 4.5 – 5.5. Due to the pH balance, the products can be used across all ranges of hair from thin to coarse, straight to curly, and even color-treated. The sustainably sourced, certified Symbiotic ingredients are equally important. This certification is a standard used in conjunction with the non-profit Ecoagents. Certified Symbiotic means that the ingredient must: be grown in undisturbed virgin rainforests, be harvested using indigenous knowledge by Amazonian natives, and be purchased from these natives at a fair price to build the local economies. Rahua is devoted to creating sustainable communities and in addition to paying fair wages, founders Lliguin and Ayers often visit to provide educational resources to the tribespeople and help create learning centers. For shiny looks with organic ingredients and sustainable practices, shop the daily hair care and treatments. To achieve varying looks, check out the styling products. Rahua’s line even extends to body care and uses the same principles for hydrated, soft skin. We shot clean Beauty Blogger Rachael (the-green-edit.com) at Bondi Beach in Sydney. She used the Rahua’s Classic Shampoo and Classic Conditioner which are also available as a travel duo. 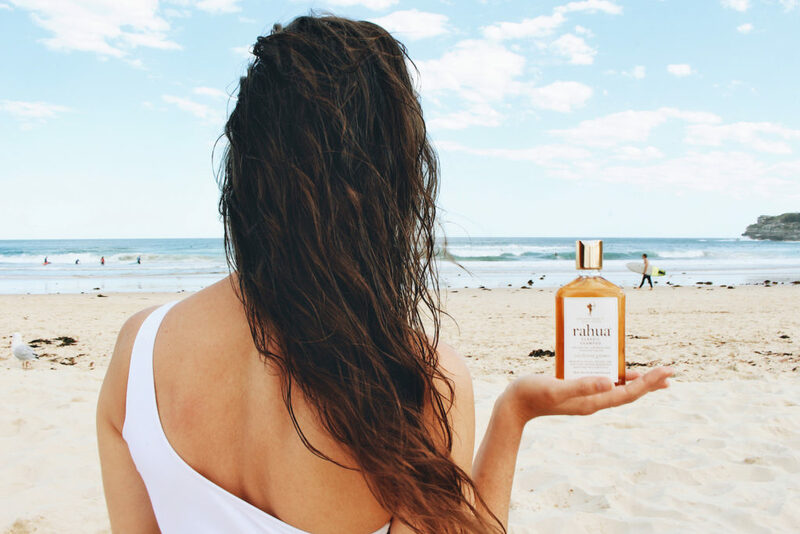 For the beach babe waves, spritz the Enchanted Island Salt Spray all over damp hair. Unlike most sea salt sprays that create a crunchy texture, Enchanted Island’s Guayaba sugars will keep hair soft and moisturized.